A new addition to the Stevie® Awards for Sales & Customer Service's repertory of awards in 2013 are the 10 Top Awards, ten best-of-competition prizes that are awarded to the organizations that submit the best body of work to the competition, in their own name or in the names of one or more clients. These awards cannot be applied for directly. Winners are determined by a points system based on the total number of awards won in the Stevie Awards for Sales & Customer Service, with a Gold Stevie win counting for 3 points, a Silver Stevie for 2 points, and a Bronze Stevie counting for 1.5. The top ten overall point winners are awarded the exclusive right to use a unique 2013 Top 10 logo designed especially for them. LAS VEGAS, NV – February 26, 2013 – Winners in the Seventh Annual Stevie Awards for Sales & Customer Service, an international competition recognizing excellence in disciplines that are vital to business success, were unveiled last night at a gala ceremony in Las Vegas, Nevada. Delta Air Lines and CubeSmart won three Gold Stevie Awards each, more than any other organization in the competition. 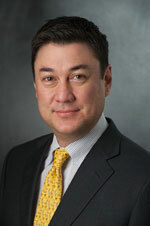 Winners of two Gold Stevie Awards are AllClear ID, Capital One Bank, the United Kingdom’s EE, John Hancock Signature Services, Kohl’s Department Stores, Marsh U.S. Consumer, OppenheimerFunds, PetRays, Richardson, VIZIO, and VMware. 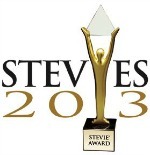 A complete list of all Gold, Silver and Bronze Stevie Awards by category is available at www.StevieAwards.com/Sales. Who's Coming to Monday's Stevie Awards Banquet? 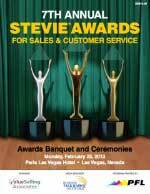 Next Monday evening we'll announce the results of the 7th annual Stevie Awards for Sales & Customer Service in the Versailles Ballroom of the Paris Las Vegas Hotel & Casino. If you're not familiar with them, the Stevie Awards for Sales & Customer Service are the world's top contact center awards, customer service awards, business development awards, and sales awards program. More than 300 executives from around the world will gather to learn the Gold, Silver and Bronze placements in this year's competition. Here are the organizations that have already booked their place for the banquet. Interested in joining them? Get your tickets now.